Jason (Steve Burton) came to Anna’s (Finola Hughes) to see Robin (Kimberly McCullough). They talked about the discovery that Peter was Anna’s son and her decision to keep it secret. Robin told Jason she couldn’t blame him if he wanted payback against Peter (Wes Ramsey) for taking five years of his life. But Jason told Robin since he couldn’t get those years back, what was the point? He had no intention of retailating against Peter out of respect for Robin and her mom. 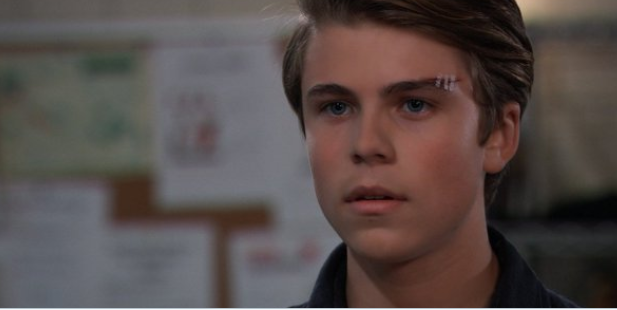 Cameron (Will Lipton) lied to his mom that the cut on his face was from him tripping on a rock. But the truth came out when Oscar (Garren Stitt) let it slip to Kim (Tamara Braun) and Drew (Billy Miller) that he and Cameron were in a fight and Kim called Elizabeth (Rebecca Herbst). Liz told her son she didn’t want him getting into fights…especially not with Oscar. 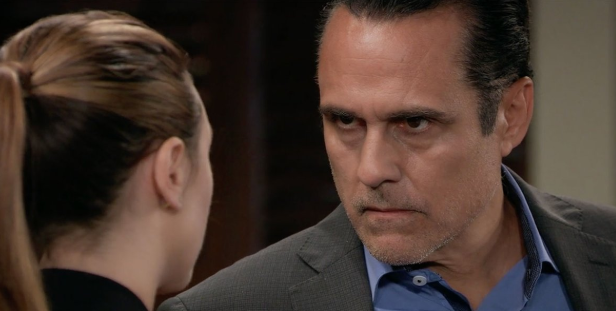 Jordan (Briana Henry) and Margaux (Elizabeth Hendrickson) arrived at Sonny’s (Maurice Benard) and questioned Mike (Max Gail) about the body that was found in the basement of the bar and why he was at Charlie’s Pub the night of the gas leak. Mike told the D.A. and Police Commissioner that he was there trying to get a job for his daughter Courtney. Mike became upset when Margaux reminded his daughter had been dead for twelve years. But after Jordan and Margaux left, Mike laughed and admitted to Carly (Laura Wright) and Sonny that he was faking. 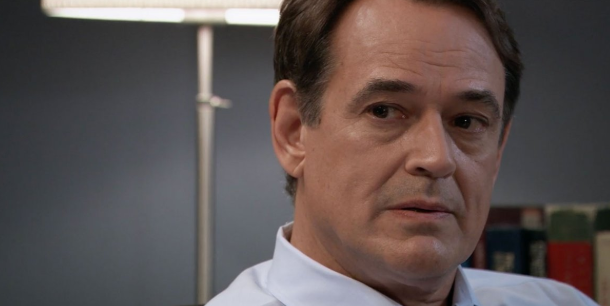 Franco (Roger Hogwarth) barged into Kevin’s office and Ryan (Jon Lindstrom) pretended to be his psychiatrist twin brother. In order to cover up an earlier slip, Ryan as Kevin urged Franco to forge ahead and look toward his future in order to come to term with his past. Elizabeth told Cameron she wanted he and Oscar to not get into fights because she and Oscar’s mother were friends. When she came over, Oscar admitted to Josslyn (Eden McCoy) he and Cameron got into a fight because Cameron told him that he (Cameron ) and Joss kissed. Robin wondered if Jason could not pursue a vendetta against her brother, could she could get to know Peter. Kim told Drew that because his test results indicated their son would survive another birthday, she wanted Oscar to enjoy it and they’d deal with the fallout later. Oscar asked Josslyn whether she liked Cameron. Taking “Kevin’s” advice, Franco told Elizabeth he witnessed the intense looking hug the other day between she and Drew and was jealous. Mike told Carly and Sonny that as he made things much worse he was going to fix it and not be a burden. Josslyn reminded Oscar that although she likes Cameron and have since they were children, she wanted to be with him (Oscar). Kim sadly told Drew that once Oscar knew the truth he’d have a dark cloud hanging over him and all she could do was to give him as much happiness as she could. Drew agreed they’d tell Oscar after his birthday. Elizabeth told Franco she was hugging Drew because he’d received horrible, unthinkable news that Oscar has a malignant brain tumor. Ryan greeted his dinner date: Lucy (Lynn Herring). Drew (Billy Miller) assured Kim (Tamara Braun) that she could trust Sam (Kelly Monaco) not to say anything about Oscar’s prognosis. He understood that Kim wanted to give their son a worry free birthday. Elizabeth (Rebecca Herbst) suggested that Cameron (Will Lipton) be the bigger person and let the fight between he and Oscar (Garren Stitt) go. She also wanted her son to apologize again to Josslyn (Eden McCoy) for kissing her without permission. Oscar suggested he, Sam and Scout spend some time together. Maxie (Kirsten Storms) was out of breath for climbing the stairs from the lobby of The Metro Court. She told Lulu (Emme Rylan) she didn’t trust the elevators after getting stuck on one with Peter (Wes Ramsey). Maxie shared how Peter was hyperventilating and took off his shirt, commenting that his abs had abs. Lulu told Maxie she was writing the 25th Anniversary of the Ryan Chamberlain murders for The Intruder. She added Kevin gave her his blessing on writing the story. Ryan met with Lulu (Lynn Herring) at The Metro Court and was surprised when she apologized for throwing away their marriage by having an affair with Scott (Kin Shriner). She told him that she didn’t want him to always think of her as Lucy The Cheater. Maxie came over to Ryan and Lucy’s table and they talked about Lulu’s writing Ryan’s story. “Kevin” told Maxie he’d help Felicia work through her feelings about Ryan. Lucy suggested she and Kevin get together with Mac (John J. York) and Felicia (Kristina Wagner). After connecting with her on social media, Curtis (Donnell Turner) met with Sasha Gilmore and told her she could be the daughter of a good friend of his. He asked Sasha to consider taking a DNA test. Nina (Michelle Stafford) came to Anna’s (Finola Hughes) house and they talked about Cassandra (Jessica Tuck), Nina’s divorce from Valentin (James Patrick Stuart), Peter and how it was losing a child. Nina told Anna how her (Nina) mother died but left her something that implied her child was still alive. Franco (Roger Hogwarth) and Elizabeth talked about how Cameron would feel after Oscar was gone. Franco felt badly for a remark he made to Drew before he (Franco) learned of Oscar’s condition. Julian (William deVry) came over Kim’s place and told her he purchased three tickets to Hamilton on Broadway for April 17 next year. Sam reminded of the weight he was carrying keeping the secret of Oscar’s condition from his son and assured Drew he could lean on her but he told her he couldn’t. Franco did some research on the Port Charles Brain Cancer Institute but left the information on the computer screen which Cameron saw. Lucy promised Kevin they’d convince Felicia that Ryan would never hurt her again. Curtis (Donnell Turner) told Valentin (James Patrick Stuart) about his meeting with Sasha Gilmore, the young woman who could be Nina’s (Michelle Stafford). He added that Sasha took the DNA test but only did so to prove she wasn’t Nina’s daughter. At Charlie’s Pub, Nina asked Maxie (Kirsten) what was up with that shirtless encounter with Peter August (Wes Ramsey) in the elevator. Maxie explained that Peter suffered from PTSD when he was stuck in the elevator due to being held captive by Liesl (Kathleen Gati). She added that Peter had been a good friend when she needed him and feels he shouldn’t be blamed entirely for what happened to Nathan (Ryan Paevey). Peter reminded Lulu (Emme Rylan) that they had to jump on her piece soon before other media outlets picked it up. He thought he should talk with the people involved. Lulu assumed he meant Felicia (Kristina Wagner) and was only doing so to get close to Maxie. Peter assured he’d never do anything to hurt Maxie and considered her a friend even if she no longer felt the same about him. He was curious when Lulu said Maxie talked about him. At the hospital, Griffin (Matt Cohen) told Kiki (Hayley Erin) he received a phone call from the monsignor that someone contacted the archdiocese and he’s been forbidden to take sacrament or get married in the church. Kiki realized her mother was to blame; she took his job and now was trying to take his faith. Griffin assured that would never happen even if he couldn’t participate in the rituals. When she overheard him discussing the Chicago branch of ELQ, Carly (Laura Wright) wrongly assumed Michael (Chad Duell) was moving away from Port Charles. Michael assured he was just opening a new office and wasn’t planning to leave town. Carly suggested Michael lean on his family to help him with his grief. Their conversation was interrupted when they saw Lucas (Ryan Carnes) carrying Wiley. Even though it was his day off, Lucas was asked to help with a patient. He left Wiley with Carly and Michael to babysit. Lulu encouraged Peter to back-off from Maxie. Lucy showed Griffin apartments, but he couldn’t sign the lease in good conscious because he hadn’t heard from the review board yet. She told him she had another apartment to show him. Alexis (Nancy Grahan) told Julian she wasn’t comfortable with Kristina (Lexi Ainsworth) working for him. Julian assured he had no part with the mob anymore. Kiki confronted Ava (Maura West) about contacting the archdiocese to have Griffin stripped of his sacraments. Then Kiki shocked Ava by slapping her mother! Ava warned the “little girl” she’d give her that one (but only one) because she was her daughter. Ava said Griffin brought everything that happened to him on himself for sleeping with women while still with the church. Kiki asked her mother whether she’d have to look over her shoulder too and promised she’d stay out of her mother’s life and wanted Ava to do the same. Michael commented how the only thing true Nelle (Chloe Lanier) wrote in her letter was how being around Wiley would offer him comfort. When Maxie approached Lulu and Peter at The Metro Court, he made a hasty exit. Nina warned Ava if she (Ava) kept acting the way she did, she’d run the risk of losing Kiki for good. Alexis worried Kristina would keep repeating the same destructive pattern. Julian promised to keep an eye on Alexis’ daughter. Griffin showed up at Kiki’s door and told her he just signed a lease for a studio in her building. The doctor approached Lucas and told he and Carly something troubling was found in one of Wiley’s tests. Jason (Steve Burton) met Stella (Vernee Watson) when she came to spend time with Mike (Max Gail). When Max and Stella went out on the patio, Jason and Sonny discussed their Julian (William deVry) situation. Julian reminded Ava (Maura West) she slept with Kiki (Hayley Erin) boyfriend Morgan and her daughter forgave her and was by her side when she (Ava) suffered from third degree burns. Julian commented how he’d give anything if his children did the same for him. Ava agreed with her brother that Kiki was her daughter and she loved her and refused to use her over the likes of Griffin Munro (Matt Cohen). Meanwhile as they awaited the apartment super’s arrival to repair the radiator, Kiki and Griffin talked about movies and she promised to take him to the Port Charles Film Festival. Brad (Parry Shen), Lucas (Ryan Carnes) and Carly (Laura Wright) learned that Monica (Leslie Charleson) was the specialist called in for the consult. She explained Wiley had the same heart condition as Alan, A.J. and Michael had but could be corrected with surgery, medication or go away by itself. Monica ordered an echocardiogram for Wiley. Once alone, Carly assured Brad he could get through anything for his children; there’s no right answer in parenthood just a serious of well intentioned mistakes. Kiki imitated Ava and Griffin and told him that he needed to stop apologizing for being a good person. Ava arrived and started apologizing for the things they said to each other. But changed her tune when she saw Griffin there and that Kiki wasn’t suffering in solitude. She learned Griffin rented a studio down the hall. He told Ava that her anger ran deep and he was fooling himself into believing love could change her. Julian assured Jason he wasn’t a threat to Sonny. After spending time in Pentonville, Jerome lost a taste for the business. Jordan (Briana Henry) told Sonny the gun used in the murder was traced back to a crime that happened in Brooklyn over thirty years ago. Mike and Stella discussed memory care facilities. He thanked her for being there for him and said to know when the day came he couldn’t remember her to know he wanted to. Michael ran into Maxie (Kirsten Storms) at General Hospital. He held James and talked about how he couldn’t share his feelings about Jonah’s death with his family. Maxie understood how Michael felt about losing the person and life he thought he would have. Brad panicked when Carly and Lucas insisted Wiley’s birth mother should be contacted to see whether she was keeping any secrets about the baby’s medical condition. Ava returned to Julian’s bar and told him Kiki Jerome was now just another enemy who took something from her (Ava) and vowed to make her pay. Jordan received a call and told Jason and Sonny they had an ID on the body and it would be only a matter of time before they found out how the murdered man tied to Mike. It was awkward at The Community Center between Oscar (Garren Stitt), Cameron (Will Lipton) and Josslyn (Eden McCoy) as they volunteered at for a school project. Elizabeth (Rebecca Herbst) admitted to Kim (Tamara Braun) she was forced to tell Franco (Roger Hogwarth) about Oscar’s condition. Kim is angry Elizabeth told Franco, but Liz assured she (Kim) could trust Franco to keep the secret. Meanwhile, Drew (Billy Miller) came to Liz’s house and he and Franco talked about Oscar and whether it would be better if Drew’s (Billy Miller) son never knew he had cancer. Margaux (Elizabeth Hendrickson) joined Sam (Kelly Monaco) at the bar of The Metro Court and asked Ms. McCall about her two ex’s Drew and Jason (Steve Burton). Their conversation was interrupted by a call from Jordan (Briana Henry) who called the D.A. back to the PCPD. When Margaux arrived, Jordan told her that their murder victim was Joe Scully’s defense attorney a man named Vincent Marino. Sonny worried about Mike if the discovery of his part in burying the body of Marino in Charlie’s Pub. 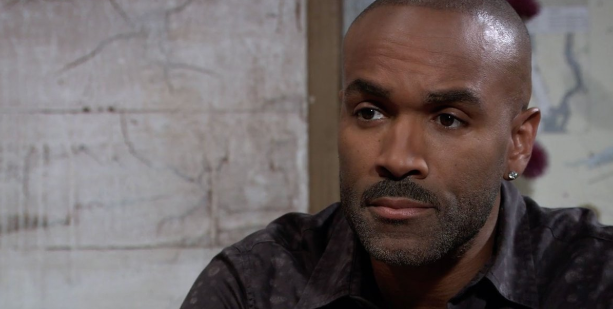 Sam arrived and told Jason and Sonny that Margaux was gunning for Sonny by questioning anyone associated with him. Drew vowed to tell Oscar the truth if Kim didn’t. Jordan and Margaux discussed theories on how Mike could have murdered Vincent Marino. 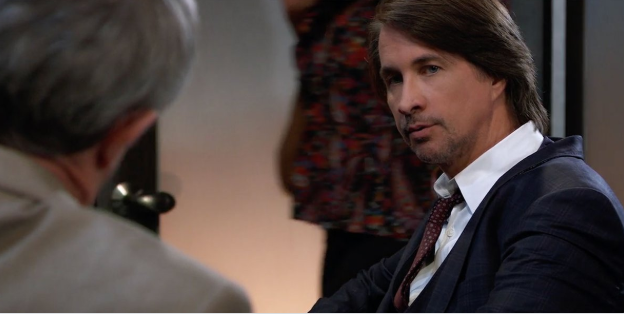 While he and Anna waited for Chase (Josh Swickward) to arrive for dinner, Finn (Michael Easton) was surprised when his father Greg (James Read) Chase appeared. After Chase came in, Finn accused it of being a set-up. Professor Chase told his sons and Anna that he was in Port Charles because he has an infectious disease and was advised by his physician to contact the best infectious disease expert in the country, namely Dr. Hamilton Finn. Chase urged Finn to treat their father. Cameron confronted Oscar and accused Nero of deceiving Josslyn by not telling her he has cancer. Jordan called Sonny and asked him to come to the PCPD for a talk. Once there, Corinthos learned from D.A. Margaux Dawson that Vincent Marino was her father.